Researchers at PNNL designed a computational model that accurately predicts the stickiness of carbon capture solvents. 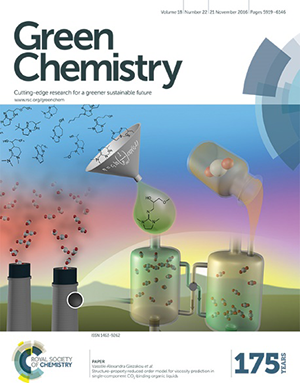 The research graces a cover of Green Chemistry. Of the 1,925 million metric tons of carbon dioxide emissions associated with electricity generation, 99 percent comes from coal and natural gas-fired power plants. Capturing these emissions is important in order to improve our air quality and possibly provide a source of carbon for chemical and fuel production. As such, researchers are searching for a method to effectively capture carbon dioxide at these plants. While water-lean solvents are one option, they thicken to the consistency of cold honey as they catch more carbon dioxide, rendering the solvent useless. Finding better options for carbon dioxide capture is laborious and expensive. Each new solvent can take months to create and longer to test—but scientists at PNNL have found a new way. They created and validated a computational model that predicts how easily a solvent will flow and how much carbon it will capture. The model offers definitive, accurate predictions about different carbon-capture solvents and it can—in a few hours or days—show the potential capture properties of a solvent. "We are figuring out how to connect the molecular-level information with bulk properties and do that in short time," said PNNL researcher Vanda Glezakou, who led the study. "Ultimately, this translates to a fundamental understanding of a technology challenge and real cost savings in synthesis, because with our model each time you try, you are more likely to get a winner." The model lets scientists quickly screen solvents and opens the door for the atom-by-atom design of low viscosity, water-lean solvents. Using the information from the model, chemists can focus on the best candidates. PNNL’s research team is using the model to screen a large library of materials to select materials that flow easily and pick up massive amounts of carbon dioxide, as well as meeting other criteria. "We are planning on taking the model and applying it to every other solvent chemistry that is out there and making it available to the scientific community," said David Heldebrant, who manages the project at PNNL. "Because we are a national laboratory, we want to address problems at the national level, such as providing cleaner power for the future." For more information, read the full highlight.